It looks like some of the bloom is off the Software-as-a-Service rose. New numbers show the booming growth in valuations of SaaS companies is slowing after a long run-up. The reason: These pure-play SaaS companies face heightened competition from one another and, perhaps more importantly, from legacy software companies that are selling their own Software-as-a-Service offerings. It’s a classic case of a maturing market: As more players enter, that increased competition takes its toll. SaaS companies “are still trading at very high valuations, just not as high. Trees don’t grow to the sky,” said Marty Wolf, the president of Martin Wolf Advisors, a company that consults on merger and acquisition strategies, which compiled these numbers from Q4 2011. In November, Wolf published research that showed valuations of SaaS companies were off the charts compared to more-traditional legacy software companies. And he predicted that growth would continue. To be fair, the growth is still there; it’s just smaller growth. Wolf used Salesforce.com(s crm), a pure SaaS player, as a bellwether for the category, and that company’s stock price has been under pressure of late. As IBM(s ibm), Oracle(s orcl), SAP(s sap) and Microsoft (s msft) beef up their own SaaS offerings, Salesforce.com doesn’t have that market to itself anymore, Wolf said. “In the past six months, SaaS has grown from an enterprise value that is at a 150 percent premium versus traditional software — to a 163 percent premium today — so it’s up 10 percent versus enterprise software,” Wolf said via email. During that same period, Salesforce.com has dropped 33 percent in its comparative enterprise value to traditional software. So Salesforce is still valued higher than enterprise software, but it has taken a hit in enterprise value, he added. 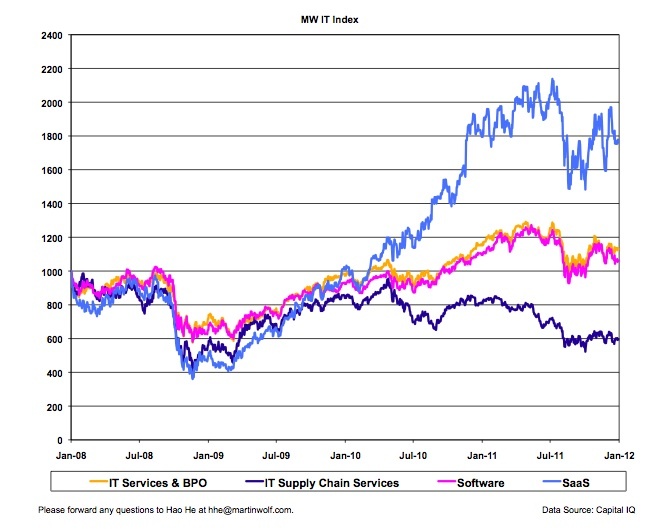 Wolf’s market-weighted-value index takes the market value of 120 companies grouped into four technology categories: IT services and BPO, IT supply chain services, software, and SaaS. The index assigned a value of 1,000 to each composite group on Dec. 31, 2008, and has tracked the category performance since then. On the plus side, Wolf said he expects SaaS revenue to continue to grow fast, as there’s too much green-field opportunity. But as companies like Oracle, IBM, Microsoft and others sell more SaaS, pure-SaaS players like Salesforce.com will face more pressure.